Hotel Lodge, London. 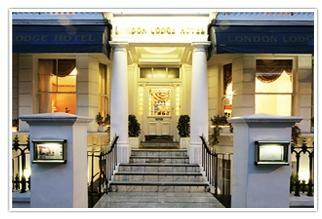 Lodge Hotel London. The London Lodge Hotel is found in a very central location near important attractions such as Olympia exhibition centre, Holland Park, Kensington Palace, Natural History Museum, Hyde Park, Victoria & Albert Museum and Royal Albert Hall. Here visitors are close to transportation, to get around the city efficiently. This beautiful Victorian style facility is composed of two houses that offer comfortable accommodations with all the services and amenities needed whether you are travelling for either business or leisure. The courteous staff has one goal; to make your stay as enjoyable as possible helping you with all types of arrangements for local restaurant reservation or getting into a local museum. Stephanie's restaurant and bar is where you will find a great meal of both local traditional style food or international favourites. It is a great place to meet with friends, colleagues or meet new people, since it is a favourite hang out for locals, as well.